Depending on who you ask, you’ll get mixed reactions about keeping cats indoors instead of letting them roam wild. 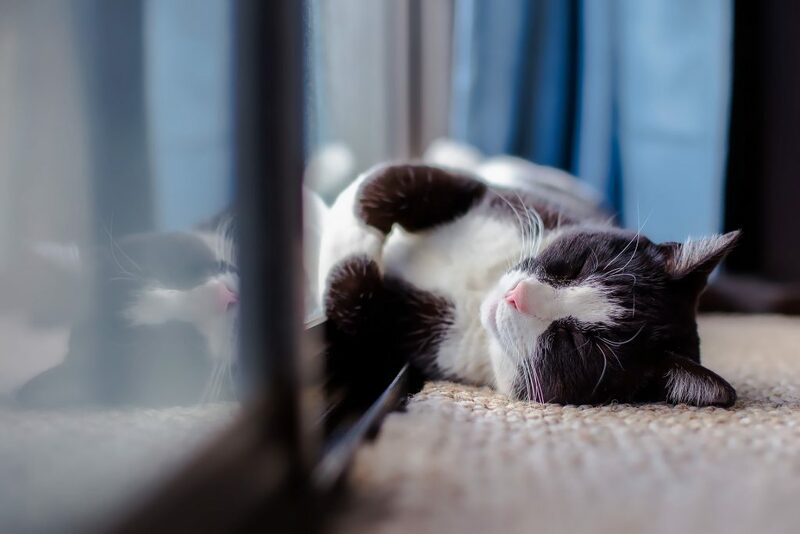 Some pet-owners with busy schedules feel guilty about cooping up their cats inside, but it might be the kindest thing you can do for your furry friends. Do indoor cats live longer? Absolutely. While an outdoor cat’s life expectancy is only 2 to 3 years, the life expectancy of an indoor cat is 15 to 20! That’s a huge difference. But why the discrepancy? The outdoors in full of dangers for your feline friends. One of the biggest concerns? Other cats. According to the American Feral Cat Coalition, there are around 60 million feral and homeless cats in the U.S. that often carry diseases. Should your cat run into these strays on his nightly stroll, he could become infected. 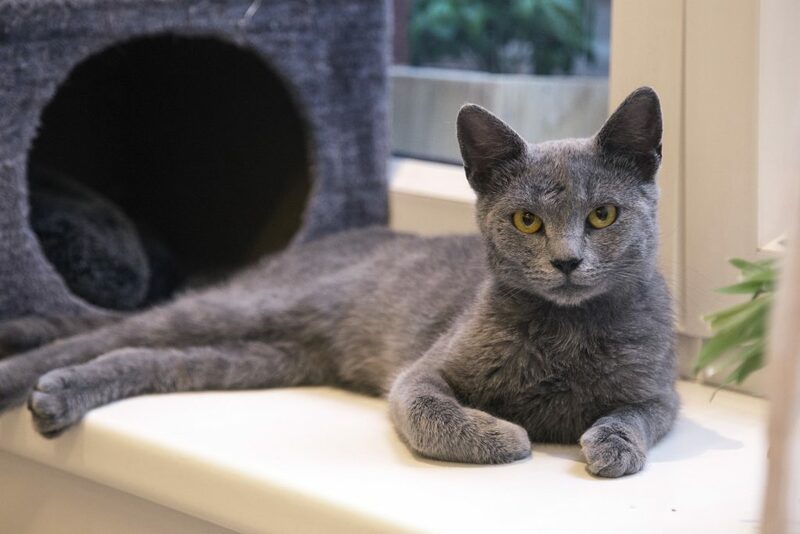 These serious and sometimes deadly diseases include feline AIDS, leukemia, feline infectious peritonitis and upper respiratory infections – not to mention the chances of your cat bringing home fleas and ticks, contracting worms, or being attacked by other cats and dogs. Some cats have even been killed by eating poisoned mice or licking up antifreeze. And then there’s the “human problem.” Cats can get hit by cars, darts, arrows, bullets; they can end up in hunting traps; and in the worst situation, can be kidnapped and sold on the black market for animal testing or skins. Want a happy kitten who gets to live all nine lives? Keep her inside from day one. 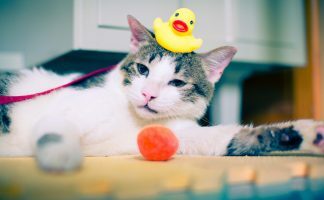 Keeping Indoor Cats Entertained: Is My Indoor Cat Bored? If you’re asking this question, the answer is probably yes. Perhaps your cat keeps acting out, or you’re the proud owner of an overweight cat who barely moves at all. Chances are your home isn’t the cat-friendly paradise it ought to be. So what should you do? Go Vertical. Particularly in homes or apartments with limited square footage, cat gyms and cat trees expand the space your cat has to exercise. 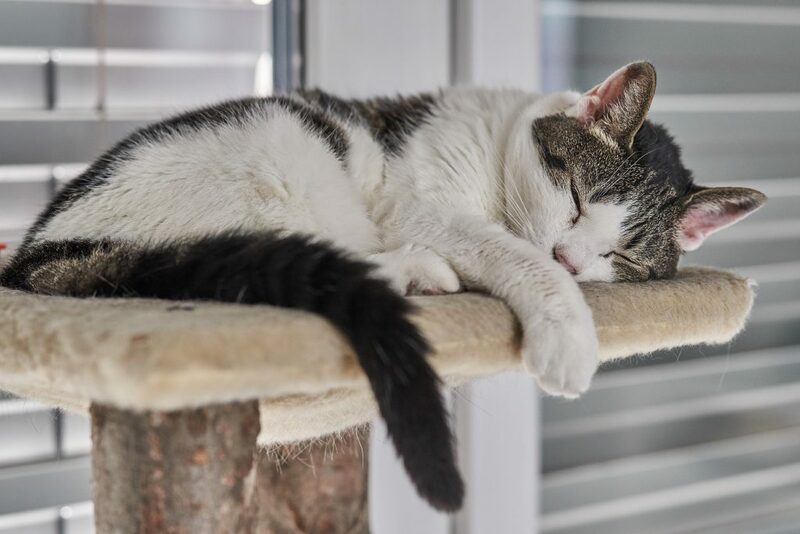 You can see our complete cat tree buying guide here. Get Sunny. I’d be surprised if your cat didn’t adore basking in the sun. Instead of having him lounge on the carpet, why not install a cat perch near his favorite window? Provide a View. A safely enclosed fish tank or an outdoor bird feeder near the window can provide endless hours of entertainment for your furry friend. Plant Something. Purchase cat-friendly grasses for her chewing pleasure in her very own indoor cat garden. Purchase some catnip that you can stuff into toys, sprinkle on his scratching post or tuck into her favorite hiding spot. Scratch Away. Invest in high-quality scratching posts or carpets to give your kitty a safe outlet for his scratching needs. Hunt Prey. 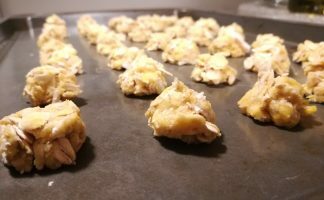 The best cat toys for indoor cats? Prey-like cat items such as mice, feathers on a fishing pole, and small stuffed animals. Be Safe. 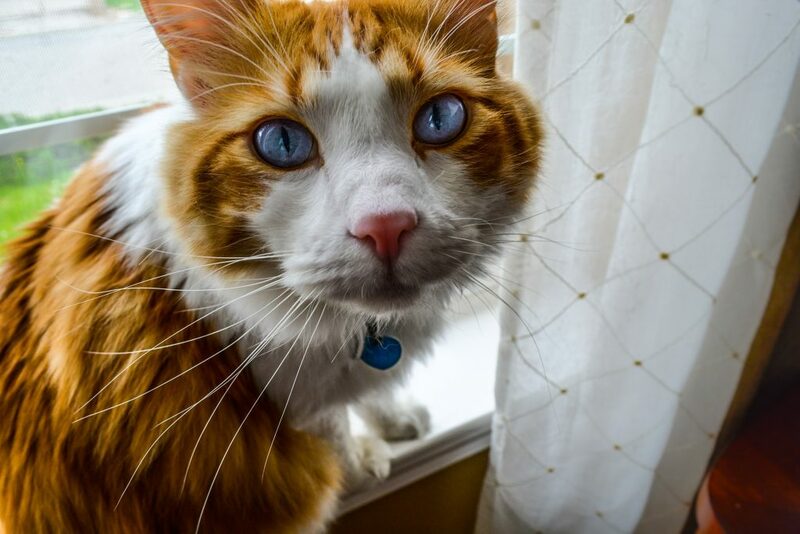 The whole point of keeping your cat indoors is to keep her safe, so make sure your home is pet-friendly. Tie up curtain blind strings or other strangulation hazards and pick up little items off the floor like paperclips or bottle caps that your cat might eat or choke on. Hide and Seek. Brown paper bags and cardboard boxes make excellent caves for kittens to hide in. Have some old wrapping paper or tissue paper from a birthday or Christmas? Leave it out and your cat will hide under it, or have fun batting it around the house. Adopt a Friend. If you think your cat will accept a potential rival, bring her home a feline friend. The company of other cats can be hugely beneficial to your cat’s health and overall well-being. And she’ll always have a playmate. Play with Your Cat. Yes, you have to work. You can’t be home with your indoor cats 24/7. But when you are home, make an effort to engage her with games, toys and activities that will keep her fit and healthy for years to come. Now that you know it’s much safer for your cat to keep him indoors, what do you do about your outdoor-loving feline? Don’t make him go cold turkey, at least not at first. After creating the ultimate cat paradise, gradually draw your cat indoors for more and more time each day. Make sure to keep windows and doors secured so he can’t bolt out unexpectedly. If he absolutely won’t settle inside, you might need to cut off his outdoor access all at once. That being said, creating an outdoor cat run or enclosure will probably be enough to satisfy your cat’s thirst for adventure. If not, try training her to walk on a leash (easier to do with a kitten than an old cat, though!) and take her for a stroll through your neighborhood from time to time. 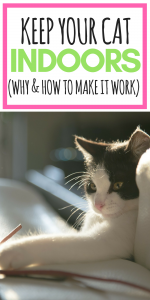 Remind yourself frequently that you are doing what’s best for your cat, and try not to give into her cries or you’ll reinforce that crying to go outside results in you opening the door (I’ve learned this hard way!). 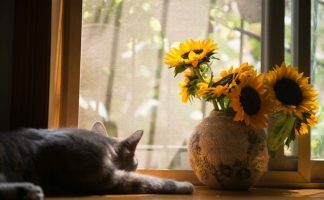 So there you have it: keep your cat indoors in a kitty paradise, and you don’t have to worry about the many dangers lurking beyond the windows!